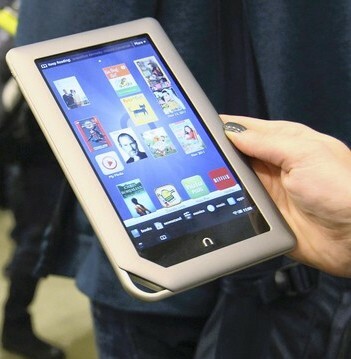 The new Nook Tablet from Barnes & Nobles features a 7-inch touch screen with 1024 by 600 pixel resolution which runs on updated Android Gingerbread OS. It has 16GB of storage and 1GB RAM(memory). With microSD card slot it can accomodate upto 32GB and make use of cloud storage. Eventhough Nook is $50 more than kindle the extra $50 will offer beefier specifications that will add up to a faster, smoother experience when reading books, playing games or watching movies. It comes with Wi-Fi option but no 3G/4G and has 11.5 hours of battery life. The new Nook Tablet comes with a price tag of $249 and currently available for preorder and will be shipped to Barnes & Noble stores and other retailers (Target, Staples, Wal-Mart, Office Max and others) late next week mid-November. The Nook Color now has a cut in price to $199 which has 7-inch touch screen, 8 gigabytes of storage and 512 megabytes of RAM. Tags:Barnes & Nobles Nook Tablet, Barnes & Nobles Nook Tablet features, Barnes & Nobles Nook Tablet specifications, Barnes & Nobles Nook Tablet review, Barnes & Nobles Nook Tablet details, Barnes & Nobles Nook Tablet availability, Barnes & Nobles Nook Tablet specs, Barnes & Nobles Nook Tablet images, Barnes & Nobles Nook Tablet pics, Barnes & Nobles Nook Tablet pictures, Barnes & Nobles Nook Tablet price, Barnes & Nobles Nook Color Tablet, Barnes & Nobles New Nook Tablet, B & N New Nook Tablet.